The clutter we have in our homes comes from having too much and not knowing what to do with it. For me I have issues with paper clutter, I’m obsessed with paper I am sure, the problem is I just don’t like throwing it away. It isn’t as though it is going to a landfill, our council offers paper recycling but I just don’t want to throw away personal information on the paper or waste a precious resource that I can use for my benefit. I am not good at throwing things away, you might think this is an odd concept if I organize my house, but I am not good with spending money, I prefer not to. So, it means that I have space for items that could possibly be thrown out. However, if there is a reason for keeping the items then why throw them away? This is the problem I have with paper; I have loved paper for years, I love to write and make notes and keep all of these and adding to this are the paper that comes into the home that I don’t want but I know I have the perfect use for it. I make paper blocks for my fire but this involves ripping up the paper and soaking it in water before compressing into paper blocks. The problem is having so much paper that I can’t keep on top of this process. Instead of having plastic toy boxes full of children’s toys, they are now full of paper that I need to turn into paper blocks for the fire. The problem is that paper keeps coming into the house and I can’t make this into blocks quick enough! They need space to dry too and that means I can’t make too many at once. I dry them on a pallet in the garage; it keeps them off the floor and allows air to circulate around them to help speed up the drying process. This is a big challenge for me, to take back my home from the paper clutter that is filling up my home and get these made into blocks for the fire or declutter completely and those paper items that are not confidential and hold information about me or my family I might have to consider getting rid of. However, the most important process is getting on top of the block making, this saves me money in the winter on fuel, they burn well and slowly which I feel is important, it would be a waste of time if they burned too quickly. I am going to double the number of blocks I make a week and this will help with the paper issue and prevent more building up. The most important point is even though I do have about four plastic boxes full of paper and possibly a bit more if I did some more decluttering; it is not too bad yet. 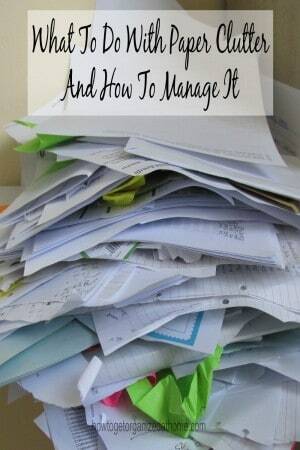 I have recognized that there is a potential problem building and I am looking for ways to put a solution together that gets rid of the paper clutter from the inside of our home. You not only have to recognize that there is a problem but you also have to stop it occurring and to tackle the problem. You might be able to recycle it through a regular service provided by the council or you might have to take it to a recycling plant. What you don’t want is it to build to a point where you are no longer in control of the situation and it becomes a bigger problem and takes over your life. The problem with paper is that it can come into our homes under many disguises and this causes problems, because you need plans for all areas, otherwise the paper clutter can build without you realizing that it is there. Have systems in place where you deal with post, children’s newsletters and artwork, newspapers, books, magazines and all those notes that you scribble down in an attempt to remember something. They all add to the paper clutter pile and they can quickly take over your home unless you organize. Therefore, if you have a problem with paper clutter, like me, then take control and make a plan to get organized, don’t fall into the trap of not seeing what is happening in front of your eyes. If you are looking for more articles on this topic head over to the landing page where you will find links to other posts on organization. What are your best tips for dealing with paper clutter? 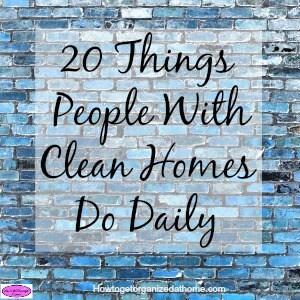 I recently wrote an article about 20 Things People With Clean Homes Do Daily, I think you will enjoy it! I have faced my paper piles since March when I did some sorting. Why is it such a dreaded chore? Maybe it’s just all those decisions. Decisions! You hit it right on the nail head, Stella! Since I moved in June, I haven’t been able to set up any systems, I’m always too busy! lol But, I am getting better about recycling stuff, so that helps. Dust too, and paper cuts. It’s just dreary. Why do I “save” paper? there are all those important papers , including lots of medical papers… Lots. I could scan them into my computer but, of course, I’m of the generation that believes they will be lost. I’ve seen friends get their mail and quickly discard “junk”.. I get mail and throw it into the pile of mail I’m collecting so I can sit down and spend time going through it .. Weeks, months later! I recently began getting the daily newspaper.. oh my! I’m not reading it! So I’m accumulating papers for weeks. Again, my friend’s newspaper is in the recycle bin by the end of the day. Recently, I discovered making baskets from rolled newspaper. I now have a container wth newspaper tubes waiting to be made into marvels of art. I can’t possibly throw out newspaper because I’m going to make art. I haven’t made a basket yet! But I will soon, right? In my defense, I have a chronic debilitating illness plus depression. Between pain and depression, I find my worry about paper funny, silly. And, so we’ve come too the answer to my “why”. Sometimes I simply can’t read with brain fog, hurt too much to sit and sort through mail, too unstable to walk to recycle bin or just too exhausted body and soul. So I’ll sit mindlessly rolling papers into pretty colored tubes to make ( someday) into pretty baskets. Smiling because I feel good enough to do that… A good day. I know that feeling all too well! I would love to see a basket made out of paper sounds interesting!